Just How Good is Kyrie Irving? I’ll be honest, and I’m pretty ashamed of this at this point. Before the 2011 NBA draft, I was arguing that Derrick Williams should have been the first overall pick in the draft. I doubted Kyrie Irving’s athleticism, defense, and I feared that he was bound for an injury-plagued career after his only year of college at Duke University lasted only nine games due to an injured ligament in his toe. My doubts were actually accurate and inaccurate at the same time. Kyrie Irving isn’t a great on-ball defender, albeit he is improving. Irving did sprain his shoulder towards the end of his rookie season, along with a finger injury in the beginning of the current season that sidelined him for a few weeks. 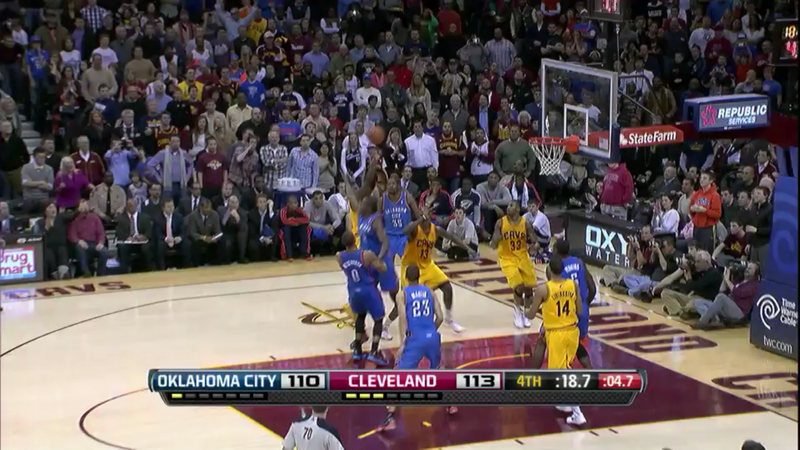 Lastly, Kyrie Irving can’t throw down monster jams like Russell Westbrook or Derrick Rose can. He can’t run the floor with the speed and quickness of Rajon Rondo or Chris Paul. So, as you can see, my pre-draft concerns were legitimate. The problem with that evaluation of Kyrie Irving is that I didn’t account for just HOW GOOD he is at everything else. Leadership: When Lebron James left Cleveland before the 2010-11 season, the Cleveland Cavaliers were left with a dismal roster with no promising young talent besides Anderson Varejao, and a team that was simply incapable of being competitive. During the middle of that season, the Cleveland Cavaliers reached a level of horribleness that was previously unseen in the NBA. Between the dates of November 30 and February 9, the squad posted a record of 1-36, including an NBA-record of 39 consecutive games without winning in regulation. Many of these games were blow-outs, including a 55 point loss to the Lakers in Staples Center. Let’s just say they were bad. On May 17, 2011, in Secaucus, New Jersey, the tide finally turned in favor of the Cavaliers. They won the NBA draft lottery, which meant the rights to draft Kyrie Irving. Irving had to wait longer than most NBA rookies do to begin what he had already waited his whole life for, due to the 2011 NBA lock-out. Once the season finally began, Kyrie was a clear leader of the franchise. Despite being just 19 years old, he was the one that took the shots at the end of the game. He was the one that led the team in scoring and usage %. He was the one that rallied the troops in the locker room to prepare for a big home game. Quite a responsibility for a teenager. This season, now 20, Kyrie Irving has evolved as a player, into an all-star. He has also further evolved in his leadership abilities. Cavaliers coach Byron Scott said that Irving is “understanding what it takes to be a leader as far as communicating with his teammates and making his teammates better. That’s the next level for him … [and] he’s well on his way”. Shooting Ability: One of the parts of Kyrie Irving’s game that is unexpectedly elite, based on evidence from high school and college, is his three point shooting. Only two starting point guards in the NBA have shot the long ball at a more efficient clip than Irving’s 42.9%. Their names are Stephen Curry and Jose Calderon. Unlike Kyrie Irving, Curry and Calderon shoot many of their threes directly off someone else’s pass. A catch-and-shoot three-pointer is much easier than one off the dribble. Just look at these numbers comparing Kyrie Irving to Stephen Curry. Stephen Curry is better than Irving in other kinds of shots, such as in transition or as the pick-and-roll ball handler, but I doubt most of you expected Kyrie Irving to be a better spot-up shooter than Stephen Curry. Although the three-point shootout at the All-Star Saturday Night festivities is generally viewed as something that is just for fun and unimportant, it is a good indicator of a player’s pure shooting ability. Kyrie Irving was the second point guard ever to win, along with Mark Price, who may be the greatest shooter to have ever played. Just watch. Being able to shoot the ball is nice, but it is far from the only thing necessary to be a great scorer in the NBA. Just look at Michael Jordan, probably the greatest scorer of all-time. What set him apart from all of the rest? He wasn’t an elite scorer. Heck, when he did the three-point shoot-out he scored all of 6 points. Jordan was the greatest of all-time in being able to create shots. If you give a contested fall-away jumper to prime Michael Jordan and to prime Kobe Bryant, Kobe would have been much more likely to make it. That wasn’t MJ’s style, though. He could get himself open with ease and knock down an easier shot attempt. Kyrie Irving gets the ball in the post from teammate Alonzo Gee, just five seconds remaining on the shot clock, with Luke Ridnour at his back. Here we are about a second later in the play. 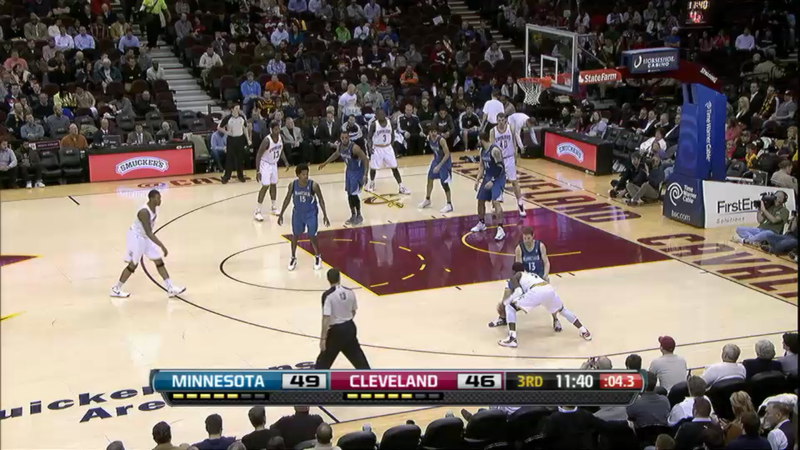 Kyrie is now isolated on the right side of the floor with Luke Ridnour still guarding him. He has turned from the post to face the basket, and throws a jab step to the right towards the baseline. 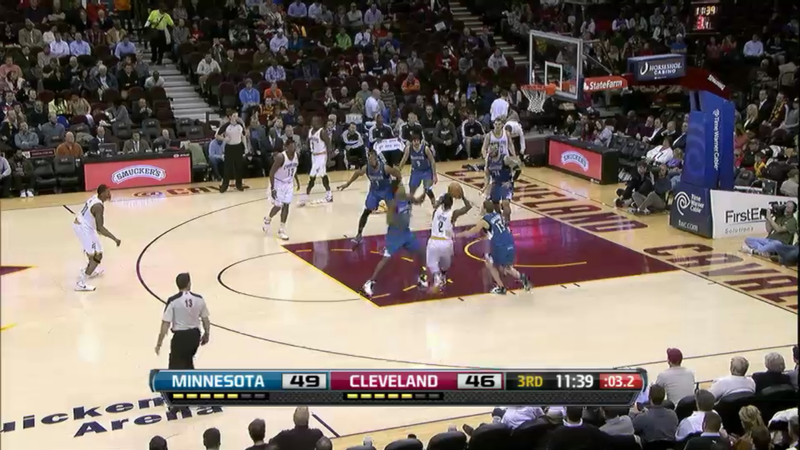 Kyrie is now penetrating through the lane to his left, setting up an easy lay-in. This play doesn’t seem like much, but it certainly displays some basketball maturity. Most young players don’t really understand that 5 seconds is plenty of time to still make a play and set up a score. Many players put in Kyrie’s situation, which came at the end of a broken play, would have tried some turn-around fade-away jumper that is certainly less likely to fall than this one. Also noteworthy in this play was the little jab step he used to get Luke Ridnour off-balance. NBA defenders are taught to key the ball handler at the waist. Your waist doesn’t move on head fakes, but it will on jab steps like this one. Game is on the line. Cavs up 113-110 with :23 left on the game clock and :09 left on the shot clock. 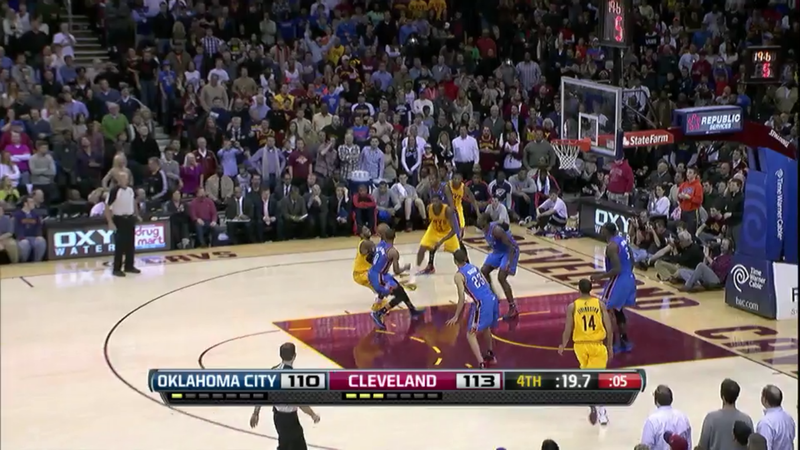 OKC needs to stop the Cavs here to give themselves a chance. 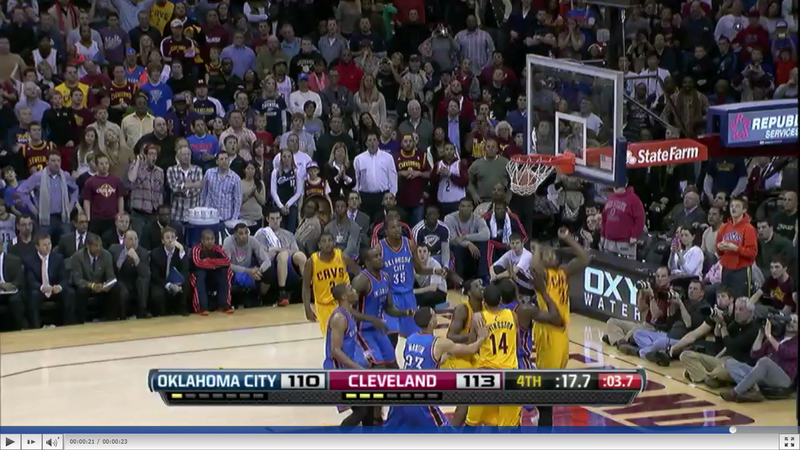 Luckily for us, we get to watch Kyrie Irving on an isolation with Russell Westbrook guarding him. 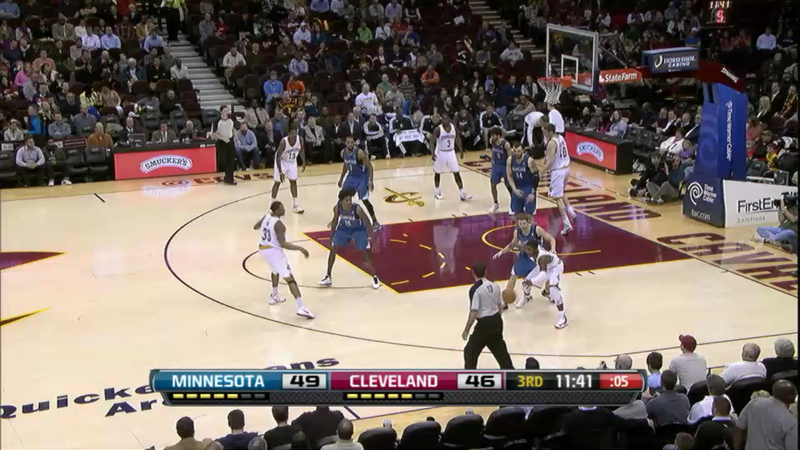 Here we have another example of Kyrie’s elite ball handling skills. I’m not sure if you saw him break Brandon Knight’s ankles at the Young Stars Game last Friday, but it was something special. 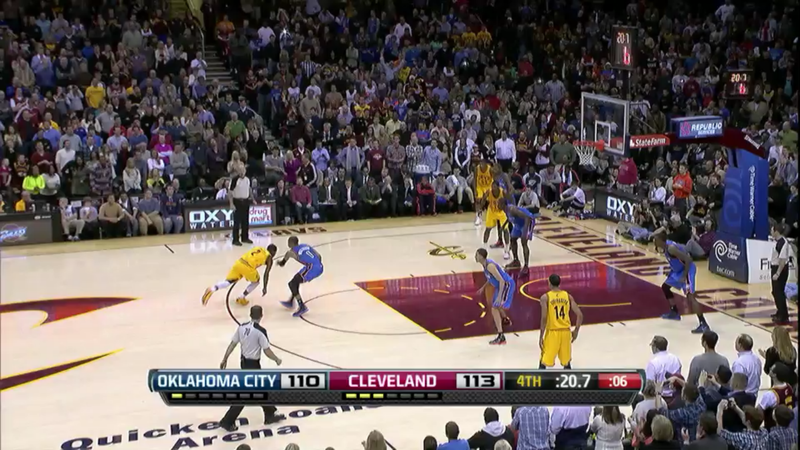 In this play, Kyrie puts a quick double crossover on Westbrook and drives to his left. 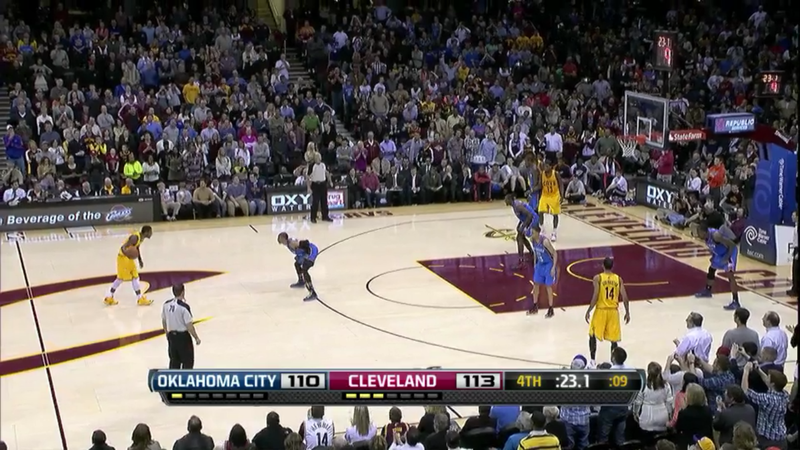 Kyrie pulls up from about 10 feet from the hoop and pump-fakes hard and quick. Russell Westbrook and Serge Ibaka, who came over to help, are both fooled and go airborne. Kyrie waits for the bodies to pass and throws up a jumper in traffic. Drains it. The shot, although you can’t tell based on this, was a bank-shot. It was the end of a big home win against an elite team. Kyrie Irving put the Cavaliers on his back down the stretch in that game. Kyrie Irving is 2nd in the NBA among all qualified players in isolation PPP. By comparison, Lebron James ranks 4th in the league and Kevin Durant ranks 13th. Irving is able to do most of this with his elite ball handling and remarkable maturity for a player who still isn’t even old enough to legally drink alcohol. Where Do We Rank Him? Here are some numbers comparing Kyrie Irving to other top-tier PG’s in the NBA this season. Not included among elite point guards are Rajon Rondo and Derrick Rose, both of whom are presently injured. These numbers are per 36 minutes played. A couple things are apparent just with these basic measures. Kyrie Irving scores at a higher rate than any other point guard. On the downside for Irving, the point guard’s role is normally as a facilitator and he has assist numbers that pale in comparison to Chris Paul or Tony Parker. Some of this can be attributed to having poor teammates, but let’s not forget that Steve Nash was able to accumulate over a dozen assists per 36 minutes in each of his last three seasons in Phoenix. His teammates were also poor, but the best passing point guards are able to set up teammates at a high clip even if they aren’t All-star caliber players. It’s difficult to accurately see who is the most efficient without looking at more advanced metrics such as true shooting % or effective shooting percentage, so let’s lay down the red carpet and bring in advanced numbers as well. As far as PER goes, Kyrie Irving is better than Curry or Holiday but trails Westbrook, Paul, and Parker. Irving’s AST% is actually better than that of Stephen Curry despite not having the offensive weapons and shooters Curry has. His defensive rating of 109 is a bit disconcerting, and Irving has been much criticized of his defense. However, offensive and defensive ratings are in many ways, team statistics, and are difficult to pin on a single player. I mean, Derek Fisher once had an offensive rating of 117 despite shooting 42% from the field and putting up 3.2 APG. It may have had more to do with the fact that he was on the floor with Kobe Bryant, Pau Gasol, Andrew Bynum, and Lamar Odom that season. Kyrie Irving may not be the best defender in basketball, but I believe he’s much better than this stat claims. Based on Synergy Sports Technology, which analyzes a player’s ability in every play type, offense or defense, Kyrie Irving allows only 0.57 points per possession on isolation plays against him. Let’s compare that to Chris Paul, known league-wide as an elite perimeter defender. Paul’s success on isolation isn’t nearly as good as Kyrie’s. He allows 0.96 points per possession on isolation plays. Irving even leads CP3 in overall defense (0.83 PPP to 0.84 PPP). I wouldn’t go so far as to claim that Irving is a better defender than Chris Paul, due to other variables involved that include defensive help on isolation plays and the fact that Irving sometimes doesn’t guard the opposing team’s best perimeter player, but I think it provides sufficient evidence to say that he’s not terrible on defense. Kyrie Irving isn’t the best healthy NBA point guard. Chris Paul is better. So is Tony Parker. Russell Westbrook might even be better too. That’s besides the point. He’s an elite player, a leader to his team, one of the best shooters in basketball, an unbelievable shot creator (especially for someone with so little experience), and a vastly underrated defensive game. AND HE’S TWENTY YEARS OLD. It’s exciting to root for a player with as much youth and potential as Kyrie Irving has. There hasn’t been a twenty year old in the NBA playing as well as Kyrie Irving since Lebron James, the man that he was drafted to replace. What a beautiful irony. Skyler Gilbert is a contributor for Hoop City Blog. He’d like to thank 82games.com, mysynergysports.com hoopdata.com, and basketball-reference.com for helping him compile the statistics used in the article. You can follow him at @skylerjgilbert. Also, it’s weird for him to be referring to himself in the third person so he’s going to conclude this article. He’s also adding this final sentence so the word count passes 2000. Damian Lillard: Rookie Of The Year? As we’ve progressed through over 1/4 of the season, questions start to ring out. One of those questions: Who should win rookie of the year? I never really passed this thought through my head, but on page 129 of the Hardwood Paroxysm season preview they thought of just that. You can see, the consensus is basically either Damian Lillard or Anthony Davis. Over a quarter of the way through the season, it’s looking like it’s Damian Lillard. Obviously, the contest for this season isn’t over, but if the season ended right now, would Lillard be a good candidate? Let’s take a look at the last 5 winners of ROY that were point guards, and recap how they were in order. At the end, we’ll see whether Lillard is deserving or not. Allen Iverson: Allen Iverson, the oldest ROY out of the people I picked, was probably the most prolific, but was also pretty bad in some stats you don’t see a lot. The biggest reason he won rookie of the year was most likely because of his scoring average (23.5 PPG) which was 5.4 PPG higher than the next-highest scorer. Other than that, Iverson didn’t really play amazing compared to the other rookies. He had the worst true shooting percentage, field goal percentage, free throw percentage and the most turnovers. All of those stats are things you don’t see a lot, but are essential to a team’s success. Essentially, Iverson was the worst non-three point shooter out of these rookies and also probably made the most mistakes. Steve Francis: Steve Francis was a hidden player out of the past six point guard ROY winners. Unsurprisingly, he also didn’t have the best stats. He isn’t the leader in any category, but at the same time is also the worst in only one category (turnover percentage). In pretty much every stat you look at, Francis is even with most of the bunch, with the exception of his excessive turnovers. Chris Paul: When looking at normal stats, Chris Paul didn’t have a fantastic season. He had the lowest PPG and wasn’t very prolific in any category- except for the ones that you don’t see as much of. Chris Paul’s stats are kind of like the opposite of Allen Iverson’s. Iverson’s were cool initially, but once you look at all of the less-popular stats, he didn’t excel. For Chris Paul, compared to all the others in their rookie season, he averaged the most assists and steals and the least turnovers per game, all stats that you like to see out of a point guard. If you keep going to advanced stats, Chris Paul kills. The most impressive stat out of all of this is that he had the best offensive AND defensive rating (114 and 104, respectively) and had more win shares (10.4) than any other player on this list by at least four. Chris Paul’s rookie season was a great one. Derrick Rose: Derrick Rose had a great rookie season, as did everyone else on this list, but not as good as some of the others that we see. The only stat category he led in that’s worth noting is field goal percentage, and that didn’t even translate to the highest true shooting percentage or effective field goal percentage. He also was the worst in assist percentage and steal percentage, categories you don’t want to be the worst in as a point guard. Kyrie Irving: Kyrie Irving. Last year’s hidden gem. No one really knew who he was until towards the end of the year, when everyone realized how good he was. Irving’s strong suit was definitely his shooting. He had the highest true shooting percentage, effective field goal percentage, free throw percentage, three point percentage (he blew out the competition with a39.9% shooting beyond the arc) and was second in field goal percentage. His downfall, though, was the other aspects of his game. He was second-worst in steals per game and the worst in assists per game, showing his lack of excellency in other areas. Nevertheless, he had a fantastic rookie season. Damian Lillard: Through 1/4 of the season, Lillard is the best candidate for ROY. His stats are just about as good as all of the other ROYs that were point guards, too. He’s not the best in any category by any means, and is the worst in the win share category by a landslide, but is pretty on par with the other guys. He’s one of the better shooters, passers and point scorers in general. The Final Verdict: Damian Lillard wouldn’t be the best guard who won ROY in the past 15 years, but he also wouldn’t be the worst. If he stays on course for the rest of the year, his stats will fit right in with all of the other guys. Keep an eye on Damian Lillard. He’s following a good path. Ugly is just one word to describe the 2011-2012 Cavs. Even though they played many more competitive games than the year before, they still looked awful a majority of the time. First overall pick Kyrie Iriving led the Cavs to a 21-45 record and the fourth pick in the draft, where they selected Dion Waiters, a shooting guard out of Syraucse. Waiters was a slightly controversial pick, as he is considered by some as a player with great potential, and others just a role player who will end up a bust. Then the Cavs traded two, early second-round picks, to move up seven spots and take Tyler Zeller at 17th overall. Other than the draft, there was not much actual activity for the Cavs’ offseason. Rumors were spread that they were in the running to end up with Andrew Bynum out of the Dwight Howard fiasco, but obviously, that did not happen. The only other notable pickups were trading for Jeremy Pargo, and signing CJ Miles. Kyrie Irving has all of the makings of a superstar. Clearly the best choice for Rookie of the Year, Kyrie silenced any critics of his lack of playing time in college or his health and showed the world he can be the next great point guard in this league. It may be a year or two before he leads Cleveland back to the playoffs, but he is only going to get better as will the help around him. With four first round picks in the past two years, the Cavs are definitely one of the young, promising teams in the NBA, their only relevant player over 25 is Anderson Varejao. Irving, Waiters, Zeller, and Tristin Thompson are the future of this team, and give fans something to be excited for in the near future. The development of these players will be the main focus of this season, and the abundance of youth will surely mean for some fun, energized games. All four have the potential to be all-stars (Kyrie is basically there), and huge factors in the league for years to come. 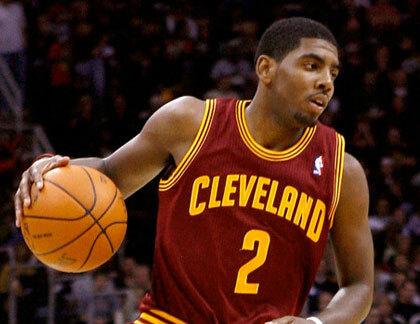 Irving has the potential to make a Derrick Rose-like jump in the near future, from budding all-star to MVP candidate. He has already shown he can take over games, and scores with ease much of the time. Kyrie is the heart and soul of the post-Decision Cleveland Cavaliers, and he is the player Cleveland needs to carry them to the playoffs. n Jamison did average 17.2 points last year, but it took him 16.1 shots, and that is not helping anyone, ever. It hurt that Varejao was only able to play in 25 contests, but the Cavs still need a lot of help putting the ball in the basket. They were 29th in the league in effective field goal percentage at .463. The addition of Dion Waiters, who posted 12.6 points per game with a .565 TS% in his final year at Syracuse, should help spread the floor and improve the Cavs’ offensive play. So far in the preseason, Zeller has looked like a solid NBA player. Coming off the bench, he could end up being a big factor on whether this team has a shot at sneaking into the playoffs. His size and rebounding ability will be a big boost for the Cavs, and you can look for many pick and rolls featuring Zeller and Waiters for the bench unit. Cleveland adds more ball handlers to play alongside Irving, as well as solid shooters. Miles is a career 41.9% shooter from 3-point range and brings experience to the team, while being just 25 years old. I doubt there are many Cavs fans that will miss Antawn Jamison. He had one of the most inefficient seasons that comes to mind, and was just annoying to watch. There really is nowhere to go but up for this Cleveland team. The future is bright with all of their recent draft picks, but it will take time to mold this young team into a serious contender in the league. Kyrie Irving can’t do all of the work, so Tristan Thompson and Dion Waiters will have to live up to their 4th overall pick-status to make the Cavs relevant again.